Completely revised and updated to include the latest developments in Internet and business applications, UNIX Shell Programming, Fourth Edition provides comprehensive coverage of Bourne, Korn, C, and BASH shells. Using a specially developed three-step process, this invaluable guide takes you through the entire universe of UNIX shell, from simple commands and programming to the world of software developers and system administrators. Using this comprehensive book, you'll be able to choose the shell that's right for you -whatever your needs or background. Lowell Jay Arthur is a principal of Quantum Improvement, a software process and quality consulting firm. He has over 21 years of experience maintaining software in IBM, UNIX, and PC environments and is the author of many well-known books on software engineering. Ted Burns has been building software systems for over 13 years and is currently a member of the technical staff at Invesco Mutual Funds. He has an MS degree in computer science. SHELL PROGRAMMING FOR THE USER. SHELL PROGRAMMING FOR THE POWER USER. 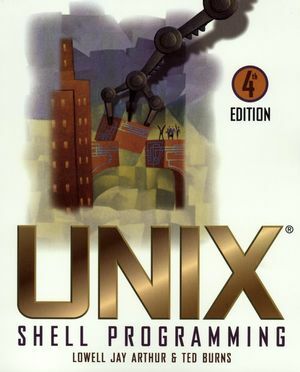 Companion site to the Book, UNIX® Shell Programming, 4th Edition. Click here to open the website in a new window.